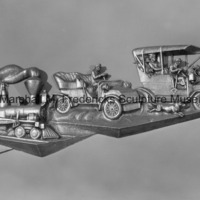 "Trains and Automobiles" from "The Romance of Transportation"
The 44-foot long relief mural was originally located at the Fort Street Union Depot in Detroit, Michigan. All three reliefs have since been relocated to the B. & O. Railroad Museum in Baltimore, Maryland. 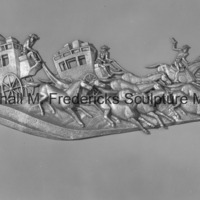 "The Opening of the West" from "The Romance of Transportation"